A new study from the Commonwealth Fund and George Washington University presented some unflattering potential effects from the enacting of the American Health Care Act. According to the study from Leighton Ku, Erika Steinmetz, Erin Brantley, Nikhil Holla, and Brian K. Bruen, the US economy would see a short-term boost from the repeal of the Affordable Care Act's taxes. But the decrease of federal spending on healthcare under the GOP's American Health Care Act would cause harm in the long-run. "It initially raises the federal deficit when taxes are repealed, leading to 864,000 more jobs in 2018. In later years, reductions in support for health insurance cause negative economic effects. By 2026, 924,000 jobs would be lost, gross state products would be $93 billion lower, and business output would be $148 billion less. About three-quarters of jobs lost (725,000) would be in the health care sector." Put another way, there would be two primary effects: Aggregate employment would decrease, leading to a drag on economic activity. Currently, the number of people working in the healthcare sector has steadily increased due to a combination of the lower uninsured rate (people are more likely to seek care if they have coverage) and the aging Baby Boomer population. With more people seeking care, healthcare providers have boosted employment and the segment has been one of the biggest gainers since the financial crisis. Under the AHCA, the study said, cuts to Medicaid and federal subsidies for people to access health insurance would lead to a curtailing of the employment growth as federal funds dried up and fewer people utilized care services. "Healthcare has been one of the main areas of job growth in recent years," the report said. 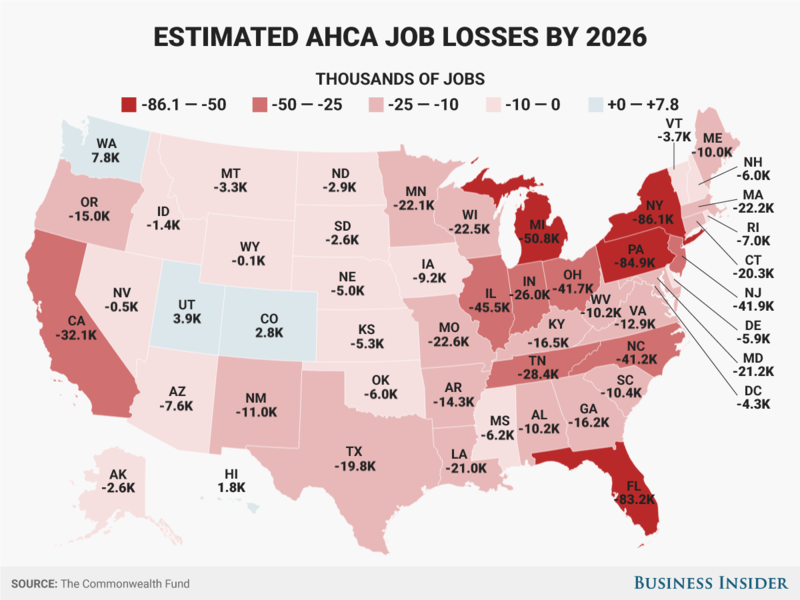 "Under the AHCA, the sector would lose jobs immediately, with a loss of 24,000 jobs in 2018. By 2026, 725,000 fewer health sector jobs would exist. This would be a major reversal from current trends." The losses, according to the study, would vary by state, with New York, Pennsylvania, and Florida taking the biggest hits. The only states that would gain employment from the law would be Washington, Utah, Hawaii, and Colorado, the study said. From there, the study said, the problems would spread. Lower employment means fewer people with disposable income to spend on other goods and services. The trickle-down effect would then result in a drag on overall economic output. "It is likely that the business cycle will eventually slow down again," the report said. "In that event, the AHCA could accentuate job loss and economic contraction. Combined with major increases in the number of uninsured, this could contribute to a period of economic and medical hardship in the US. The AHCA could exaggerate both the highs and lows of the business cycle."